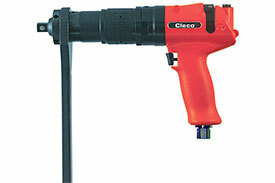 Cleco Pneumatic 64 Series Trigger Start Reversible Selectork Pistol Swingbar Nutrunners feature a Selectork adjustment that allows air pressure regulation at the tool for individual performance from a common air line. Cleco Pneumatic 64 Series Trigger Start Reversible Selectork Pistol Swingbar Nutrunners also feature a swingbar, a pistol grip, and are reversible. Cleco Pneumatic 64 Series Trigger Start Reversible Selectork Pistol Swingbar Nutrunners feature a high power-to-weight ratio and slim profile nose that delivers more torque to hard-to-reach joints. Cleco Pneumatic 64 Series Trigger Start Reversible Selectork Pistol Swingbar Nutrunners feature heavy-duty gearing that is designed to withstand high torque output. The durable sliding reversing valve on the Cleco Pneumatic 64 Series Trigger Start Reversible Selectork Pistol Swingbar Nutrunners is conveniently located at the rear of the housing. Cleco Pneumatic 64 Series Trigger Start Reversible Selectork Pistol Swingbar Nutrunners also feature an ergonomic soft-touch handle. Output torque from a stall tool is achieved by adjusting the air pressure to the tool. If the tool is moved from location to location or if other tools requiring full line pressure use the same air line, the tool will require a dedicated air pressure regulator. The Cleco Selectork feature in the 64 Series tools is a small pressure regulator that takes the place of the standard air inlet bushing and eliminates the need to have a separate pressure regulator installed in the plant floor system. Because of the small size of the Selectork there is a limited pressure adjustment range of from 60 to 90 psi. To order this option on the Cleco 64TTS Swingbar tools replace the S in the model number with a K (64TTS.to a 64TTK.). The goal of any fastening application is to maintain a high degree of accuracy while minimizing the length of time required to perform the rundown. The Cleco 64 Series Swingbar Nutrunners utilize a single powerful motor that limits speed shifts and offers a fast and accurate rundown regardless of joint type. Competitive units with high RPMs quickly drop their speed at threshold resulting in an overall longer rundown period. This gap is multiplied when prevailing torque is present. To read the graphs below, the orange line represents the tool speed while the blue line represents the torque generated throughout a rundown. Notice the correlation between speed and torque and its overall effect on rundown time. The 64TTK75D4 Cleco Pneumatic 64 Series Trigger Start Reversible Selectork Pistol Swingbar Nutrunners, 1/2'' Square Drive is one of thousands of quality tooling products available from MRO Tools. Please browse Cleco Pneumatic 64 Series Trigger Start Reversible Selectork Pistol Swingbar Nutrunners for tools similar to the 64TTK75D4 Cleco Pneumatic 64 Series Trigger Start Reversible Selectork Pistol Swingbar Nutrunners, 1/2'' Square Drive. 64TTK75D4 Cleco Pneumatic 64 Series Trigger Start Reversible Selectork Pistol Swingbar Nutrunners, 1/2'' Square Drive description summary: Cleco Pneumatic 64 Series Trigger Start Reversible Selectork Pistol Swingbar Nutrunners Square Drive: 1/2'' Torque Range: 41-55ft-lbs / 56-75Nm Free Speed (rpm): 340 Overall Length: 11.5'' / 290.8mm Weight: 6.3lbs / 2.9kg Air Inlet NPT: 3/8'' Quantity discounts may be available for the 64TTK75D4 Cleco Pneumatic 64 Series Trigger Start Reversible Selectork Pistol Swingbar Nutrunners, 1/2'' Square Drive. Please contact MRO Tools for details.